Finally, the second edition of FX Options and Structured Products has now been published. It took more than 10 years, but with much removed and added material, it has changed quite a bit. For avoidance of doubt, the material I removed is different from the material I added. There are numerous books on quantitative finance, and I am myself originally a quant. However, very few of these illustrate why certain products trade. There are also many books on options or derivatives in general. However, most of the options books are written in an equity options context. In my opinion, the key to really understanding options is the Foreign Exchange market. No other asset class makes the symmetries so obvious, and no other asset class has underlyings as liquid as the major currency pairs. With this book I am taking the effort to go beyond common literature on options, and also pure textbook material on options. Anybody can write a book on options after spending a few days on an internet search engine. Any student can learn about options doing the same thing (and save a lot of tuition going to business schools). 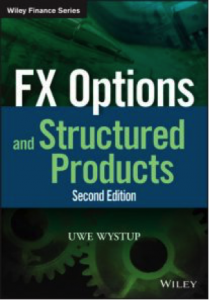 This book on FX options enables experts in the field to become more credible. My motivation in writing this book is to share what I have learned in the many decades of dealing with FX derivatives in my various roles as a quant coding pricing libraries and handling market data, a structurer who deals with products from the trading and sales perspective, a risk manager who runs an options position, a consultant dealing with special topics in FX markets, an expert who resolves legal conflicts in the area of derivatives, an adviser to municipalities how to deal with currency risk, and last but not least as a trainer, who has been teaching FX options now for the second generation, a job, during which I have received so much of valuable feedback, that many sections of the first edition need to be updated or extended. And obviously, since the publication of the first edition ten years ago, new products have been trading and new standards have been set. So it is about time. I really couldn’t leave the first edition as it is. Moreover, many have asked me over the years to make solutions to the exercises available. This book now contains about 75 exercises, which I believe are very good practice material and support further learning and reflection, and all of the exercises have come with solutions in a separate Solutions Manual (published by MathFinance, ISBN: 978-3-00-057591-4). It is now possible for trainers to use this book for teaching and exam preparation. In fact, it can be used to prepare for the ACI Diploma. New sections in the book include but are not limited to target forwards, forward volatility agreements, correlation swaps, currency fixings, long-term FX, treasury case studies, IFRS9 hedge accounting for structured products, the exotics pedigree, pricing of first generation exotics with smile, currency related swaps (CRS), smile conventions, and a glossary. The book launch in our Frankfurt office is planned for 20th September. In a relaxed after-work atmosphere I will go through all the 472 pages in detail and look forward to inspiring discussions. We are also planning an event in Singapore in November. If you wish to participate, please check with us at info@mathfinance.com if we still have space.